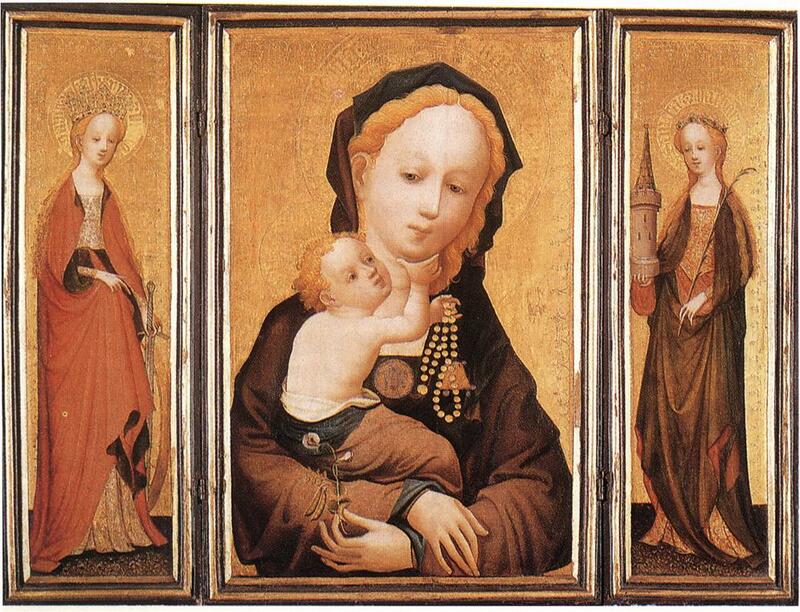 This altarpiece is one of the most important examples of the late Gothic 'Weiche Stil' or 'soft style'. Богородица изображена с цветущим душистым горошком, Младенец - с чётками. Гороховый стебель - необычный атрибут, символизирующий девственность БР. The saints on the wings are turned towards the centre panel with the famous Virgin of the flowering sweetpea. The pea stem - not a vetch as thought earlier - is an unusual attribute symbolizing Maria's virginity. Центр - орех, створки - дуб. Tempera on wood, central panel of walnut, wings of oak. 199х591 + 395х589 + 199х591.